With an objective to stand high on all the prospects of our patrons, we are betrothed in presenting a broad collection of Separators. These products are offered by different industries; these products are highly demanded. Additionally, these can be availed from us in bulk and sole as per the needs of our customers. The filters are designed mainly for natural gas application. - Installation configurations: Vertical or Horizontal. - Separation efficiencies: Depending on the type selected, separation efficiencies are typically 99.5% removal of all solid and liquid particles greater than 5 microns size. 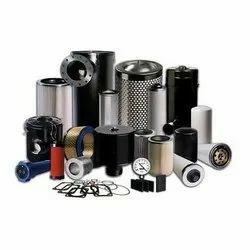 we are dealing in Air/Oil Filters & Separators. Engineered to maximize the reliability of hydraulic systems and components, Parker’s filtration products offer maximum protection against fluid contaminant. We offer high, medium, and low pressure filters, as well as portable filter carts and replacement elements. Our comprehensive line of pressure and return line filters enhances machine life and reduces maintenance. Amerkleen m80 is a disposable continuous filament progressive density glass fibre media impregnated with aaf viscosine® adhesive gel providing high arrestance and dust holding capacity. Amerkleen filters are particularly suited for use a pre-filters for gas turbines, compressors and other reciprocating equipment. Available in pad and roll.